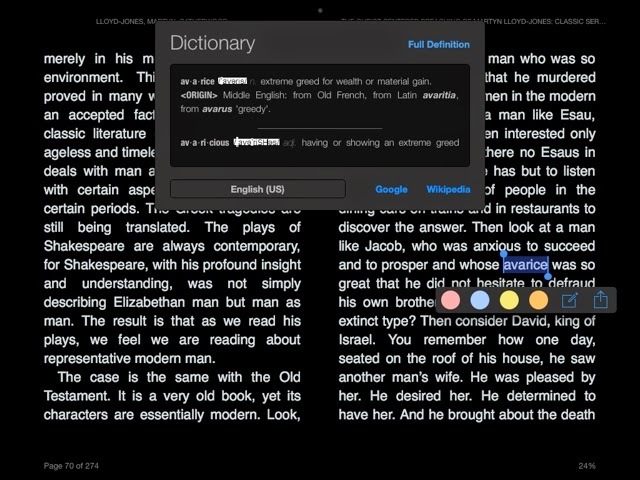 Do you use the dictionary tool embedded in the tools in your favorite eReader or browser? What about your students? Once your students are proficiently reading at a middle school level they probably aren't likely to run across (many) unknown words in popular fiction, but what about content specific words in textbooks or course specific literature like Shakespeare or Hawthorne? Remembering from my own experience, your students traditionally have three choices (and these are still advocated, I know) - keep a paper dictionary at your desk/in your backpack to look up words whenever necessary, attempt to use context clues to get an idea, or skip over it and miss out on comprehension of the text. 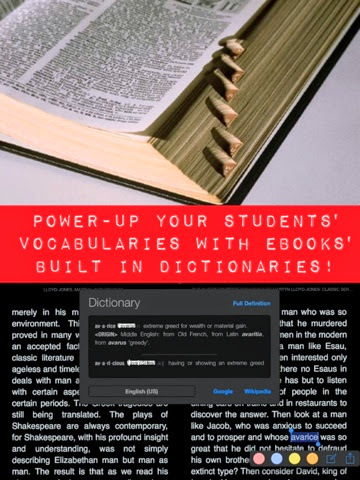 I've got a lot of respect for students willing to keep that dictionary with them (or even willing to reference a standalone app), but why are we making it so hard on our students (or yourself)? 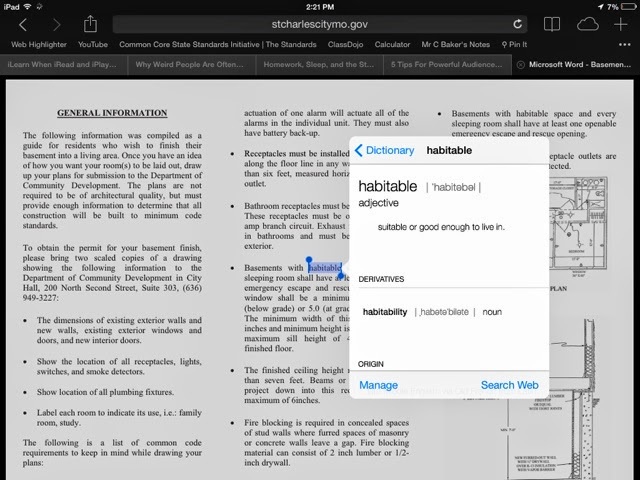 When you give your students ebooks and web resources to read, definitions are a highlight-and-tap away. 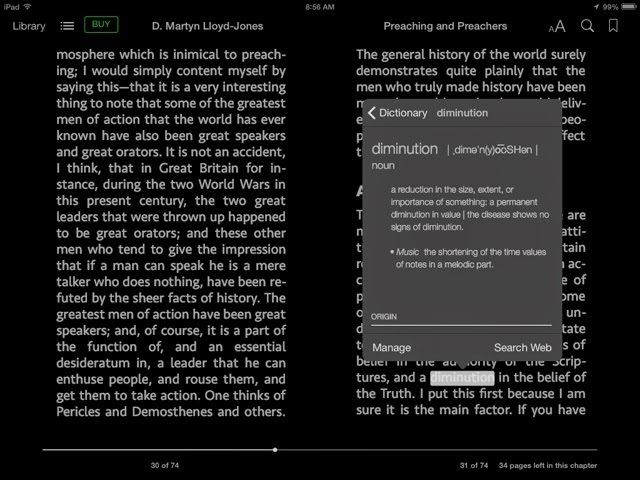 Your definition comes on-screen and in context. Imagine how you could unlock your students' potential to learn through reading if they weren't frequently skipping new words (or skipping the reading altogether because it seems insurmountable). Your district may not have a license for the corresponding ebook to your text, but you can use these tools to get your students access to alternative texts they could use in class or on their own devices. This Mac app allows you to bring in text, images, and video to create an ebook perfectly formatted for iBooks (although it would still work in other ereaders, as well.) you can share your books created in iBooks Author just as I do with my Flexbooks from CK-12. Someone in your social network. Fellow AP Stats teacher, Julie Kindred (@jkindred13), has made most (if not all) of a stats book in iBooks Author and was willing to share her treasure with me. Maybe you are as fortunate as I am and have someone in your network who has done the same for your needs. Or you and a few friends could collaborate on one!